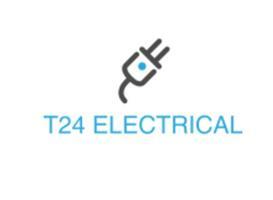 T24 Electrical - Electrician based in Eynesbury, Cambridgeshire. T24 ELECTRICAL specialise in all aspects of electrical work. We are based in St.Neots and cover areas in Cambridgeshire and Bedfordshire. We offer a wide range of electrical services including fuseboard change / full rewire / part rewire and minor works. This includes socket changes, light fittings and more. T24 Electrical provide a professional and efficient service with a friendly face. Customer care is paramount before, during and after installation. We thrive on our positive feedback. The company was founded by Tom who is fully qualified with over 8 year experience. The company is ELECSA Part P registered. Our work is carried out to the highest standard to ensure the customer is happy throughout the whole process. We are happy to provide a free no obligation quotation for any minor or major electrical work. Our quotes are honest and competitively priced to ensure there is no hidden cost. Thank you for visiting, please do not hesitate in getting in contact should you have any further questions.